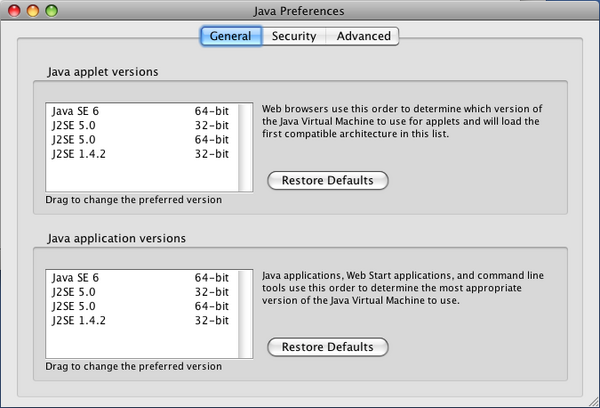 To run Your Freedom on Mac OS X version 10.7 and above you need to install Oracle Java first. It is available for free from the Oracle Java SE download page. Choose the top-most version if more than one is offered. It does not matter whether you install the JDK (the Java Development Kit) or just the JRE (the Java Runtime Environment); if you are never going to mess with Java yourself the JRE will do and it is a lot smaller. 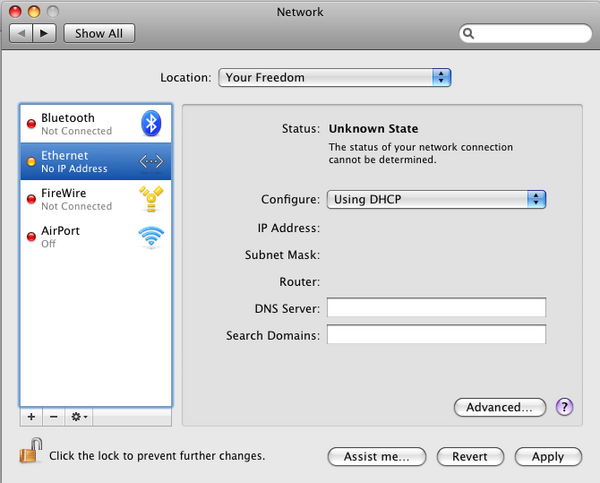 Now download the appropriate Your Freedom installation package from our Download page (the one for OS X 10.7 and newer). Put the ZIP file on your desktop and unzip it by double-clicking it. If you want, move the unzipped application to an appropriate location (the Applications folder would be suitable I guess). Your Freedom runs on Mac OS X 10.5.7 - 10.6.x, but not on earlier 10.5 versions because it requires Java 6 and earlier Mac OS X versions do not provide Java 6. This description only applies to Intel based Macs. If you are using a 32bit based Mac, please check out the forums, there is a post in the feedback section explaining how you can do it; just search for "non-Intel Mac" and you'll find it. If you don't see "Java SE 6" in there you need to install an update package. Visit http://developer.apple.com/java/download/ and get the "Java for Mac OS X 10.5 Update" package (whatever version is current). 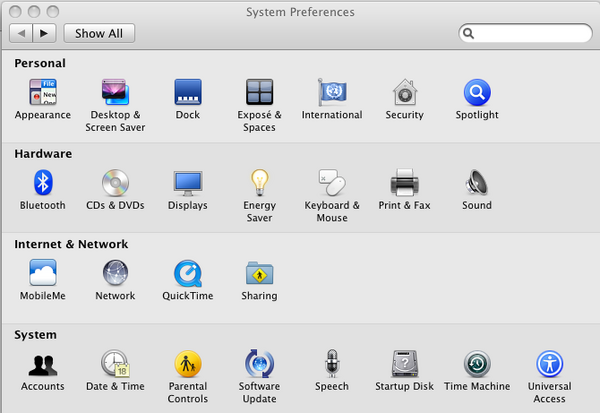 Once you've installed it, drag and drop "Java SE 6" in the Applications area to the top. 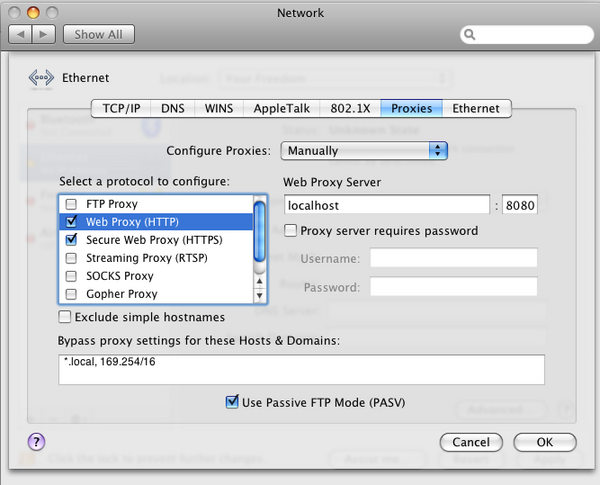 Now download the ZIP file for Mac OS X from our download section. Put it on your desktop, then double-click it, this will create the application on your desktop. Drag the Your Freedom application into your Applications folder if you like (you can also leave it on the desktop). The actual configuration process is the same for all operating systems. Please refer to the User Guide. When done, click "OK", then click "Apply". 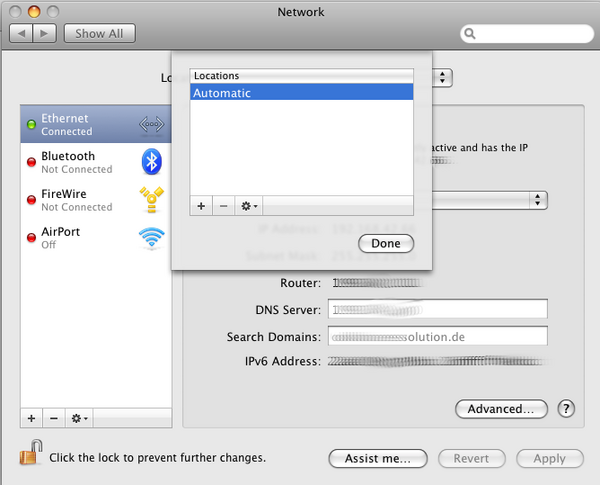 Your new settings will become active and your browser and many other applications will now use Your Freedom. 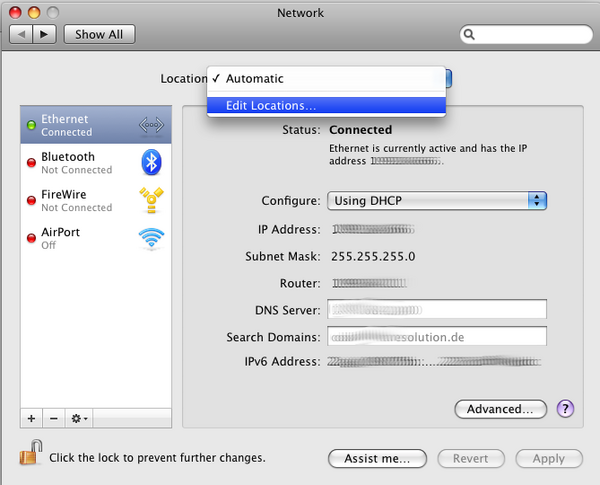 To switch back to your normal network settings, just open the System Preferences panel again and choose another location, then click on "Apply" -- easy as that! 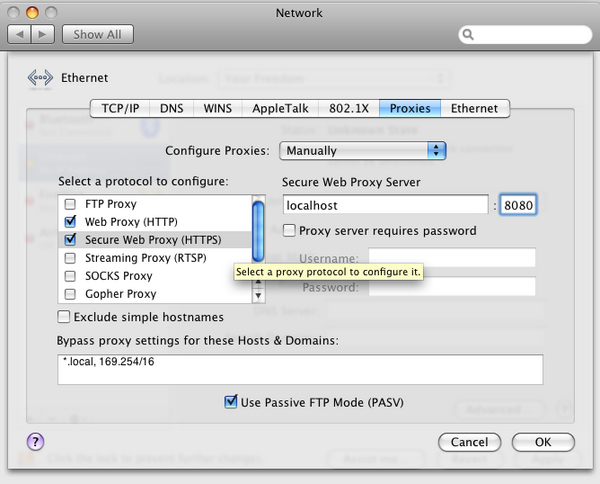 Not all applications will honor the proxy settings configured in the System Preferences (for example, Your Freedom doesn't or it wouldn't be able to get connected). 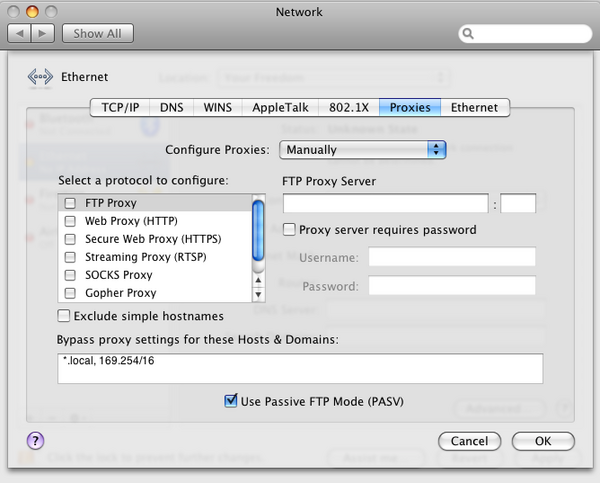 With these applications you can use OpenVPN mode -- in which you don't have to change your "Location" to "Your Freedom" unless your current "Location" has proxy settings. How can I run YF in "dump mode"? Open a terminal window (Applications/Utilities). In there, "cd" to the application installation path. Let's assume you've unzipped the original archive to your desktop, you'd have to type "cd Desktop". Then traverse into the application directory by typing "cd Your\ Freedom.app", descend down to the place where the Jar file is kept by typing "cd Contents/Resources/Java". In there, type "java -jar freedom.jar --dump" or "java -jar freedom.jar --shortdump", depending on whether you would like a full or a short dump (in most cases a short dump is enough). This will bring up the YF client in "dump mode". Reproduce the problem, then exit the YF client. There will be a "dump.log" file on your desktop now. It should contain enough information for us to check what's wrong if you send us this file.